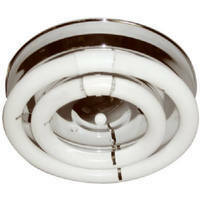 The old fixture looked like this, with a plain plastic cover to hide the bulbs. This past weekend, I decided to tackle a home improvement project I’ve had on the back burner since we moved in last June: the lighting in the kitchen. The existing fixture was one of those fluorescent jobs with the two Circline circular bulbs that throw off an insufficient amount of light. Needless to say, the fixture was ugly — it only had a plastic cover that failed to hide just how industrial the lighting was. We’d turn on the light in the kitchen and it barely registered. Especially when the fixture began shorting out the “brighter” of the two fluorescent bulbs. That’s when I knew it was time to upgrade. I wanted to put up a ceiling fan with a light kit and kill two birds with one stone: increase the lighting and add some circulation to the room. I knew what I needed: a ceiling fan with a light kit that three off a good amount of light. I also realized I had to size it properly, since the standard 52-inch fans would be too big for our kitchen, as there are cabinets in the way. I measured the distance from the center of the existing fixture to the nearest cabinet, and it was 50 inches. So I had to go with something markedly smaller — a 42- or 44-inch model. Once at Home Depot, I scouted the models. An all-black model was preferred because that’s the color of our appliances, but they were all too big for the room. A white one would do the trick, though, since our moldings/trim are white. I finally settled on a 42-inch model with reversible fan blades (white/light oak) using three 60-watt bulbs. The cost was $49.95, not too terrible. At first, I was skeptical about being able to install it myself. It wasn’t the electrical aspect of the process, but the logistics. Would I be able to hold it up while doing the wiring? The first thing I did was shut off power to the fixture. I eventually found the breaker needed to shut it off through trial and error (I need to update the listing on the electrical panel). Then, I read through the directions (something I highly suggest). It seemed easy enough. And the bonus? The ceiling bracket that would be installed first had a handy hook on it so the fan would hang while I dealt with the wiring. The installation was easy enough — the electrical box in the ceiling was already braced between the joists, meaning I would be able operate the fan without it wobbling. I screwed in the fan bracket to the box, and the wiring was a cinch (black to black, white to white, ground). I then secured the main fan component to the bracket. The light kit was a simple two-wire connection. 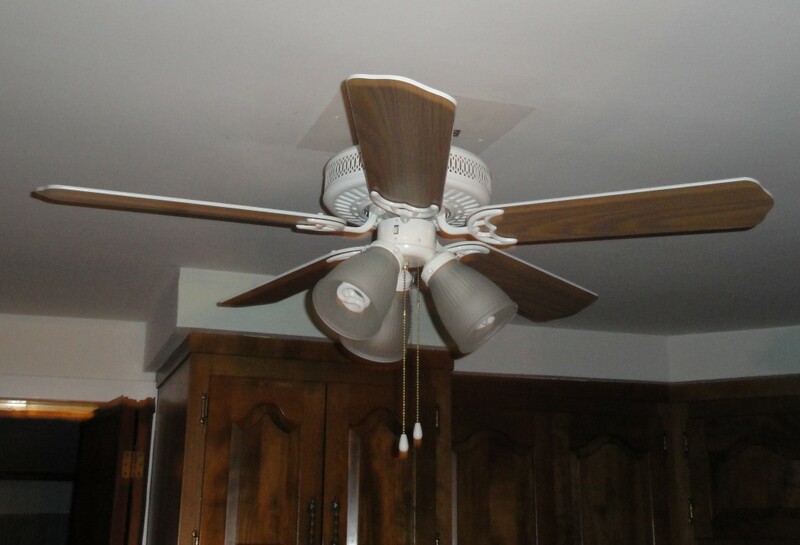 Finally, the fan blades were screwed on (I wound up using the “light oak” side). Added the two chain pulls as a finishing touch, and that was that! I obviously need to paint the ceiling around it — that square isn’t even from the previous fixture! It must have been covered up by the circular one. So now we’re one step closer to a better kitchen. Up next? I’d love to replace the stovetop light fixture (just a shielded single bulb), which seems to have shorted out. Thank goodness for this new fixture — it was hard to see what I was cooking once the sun set for the day! I also got a few paint samples while I was at Home Depot, and I’m trying to figure out which shade of green/green-blue I want to use. They’re muted, but I don’t want anything that’s too minty or mossy. Sage, perhaps. Then, we’ll get the countertops and backsplash done (I draw the line at DIY-ing that) and put down new floors (THAT I will likely do myself). their is actually some thing I have already been which means to perform within our loft area. There is currently a light-weight permanent fixture generally there therefore ideally it will likely be as simple as a person do this audio. Information self-confidence increase. This is something I’ve been meaning to do in our loft. There’s already a light fixture there so hopefully it will be as easy as you made this sound. Thanks for the confidence boost. We just installed a new ceiling fan in our bedroom 🙂 I absolutely love it. Good job! You even made sure to get a model that could take regular bulbs!